Baccarat is popular with players because of its simple betting options, fast gameplay, and favorable odds. To the first-time player, baccarat may seem like an intimidating game reserved only for those sophisticated enough to understand its nuances. While it is a popular game amongst high stakes players, it actually is quite simple to play. 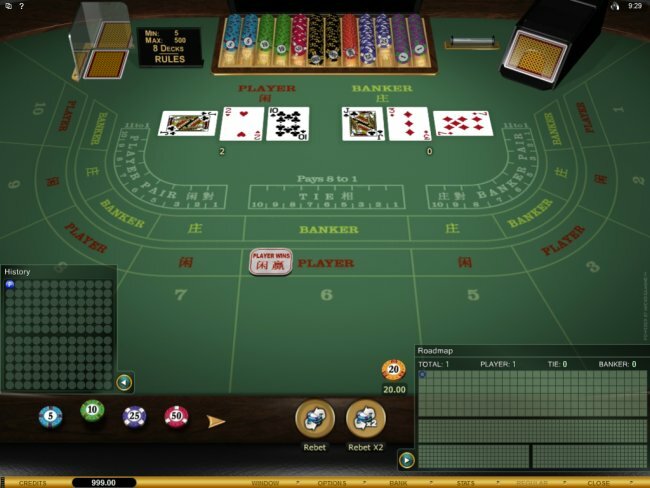 A player is responsible for making only one decision, whether to put their chips in the table area marked 'Player', 'Banker', or 'Tie'. The rules of play in baccarat have been carefully constructed to produce a small, yet measurable advantage for the house for both player and banker bets, and a steep jump in advantage for tie bets. Complex calculations are used to determine that the banker will win 50.68% of all non-tie hands and the player 49.32%. Using 100 credits worth of bets against these percentages shows that you can expect to lose 50.68 and win 49.32. The difference between the two is 1.36, hence a 1.36 house edge against the 'player' bet. So why then does the banker bet offer no real house advantage if it wins more than half of the time (50.68%)? Well, casinos are definitely aware of this advantage. If they allowed the game to be played while giving up an edge to players, they wouldn't make any money. Casinos have taken this odds discrepancy into account, and made adjustments to tilt the advantage back into their favor by way of a 5% commission on winning banker bets. The banker bet odds can be calculated as follows: let's say you are wagering 100 credits. Taking into account the 5% commission on winning banker bets, you will win 0.95 credits for every one credit wagered. Expecting to win 50.68% of the time, multiply 0.95 by 50.68 and you get 48.15. You still can expect to lose 49.32, and the difference is 1.17, resulting in a 1.17% house advantage. Tie bets happen approximately 9.55% of the time, meaning the true odds of a tie bet are 9.47 to 1. Dividing 9.55 into 100 gives us 10.47 and taking into account the fact that you will receive your original wager back, the proper odds are 9.47 to 1. So, winning a tie bet should have you winding up with 10.47 credits, but instead you wind up with 9. Dividing the difference, 1.47, into 10.47 gives the house a 14.4% advantage. You might be tempted by the 8 to 1 payout, but the odds on this bet are unfavorable compared to the banker and player bets. Logic dictates that despite the 5% commission attached to winning the banker bet, it still offers the most favorable odds in baccarat, and over time you can expect to lose less by utilising this option. Learn about the various bets available and basic elements of gameplay in baccarat game rules.